By popular demand, we’re preparing to launch a new product that’s the perfect complement to our panel extenders. The OBEX Desk Mount Privacy Panel is designed for use with any flat worksurface. Mount these panels on a desk, table, or workbench. 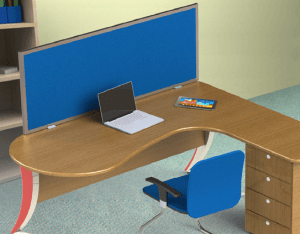 These desk dividers are available in all of the same fabrics and polycarbonate options as our cubicle dividers. You can also order them with custom tiles. As you’re probably aware, the cubicle is a type of office furniture that’s gotten a really bad rap over the years. A significant percentage of companies are moving away from panel based systems altogether. That’s not surprising with today’s emphasis on “collaboration” as a top priority in the workplace. This means that a lot of office designs are now fully open with no panels at all. Benching worksurfaces and other space-saving solutions are making inroads as alternatives to the cube. Many architects, commercial interior design consultants, and facility managers see the value in these more open environments. However, the reality of actually working in this type of setup doesn’t always meet the needs and expectations of employees. But when you’ve invested tens or hundreds of thousands of dollars in workstations that aren’t equipped with panels, it’s hard to consider switching to cubicles. Even adding freestanding panels would be a very costly process. Fortunately, it’s not necessary to start from scratch to give desks a makeover to add noise control and visual privacy. Our customers have been asking for a desk-mounted divider for a while now. So, after half a year of designing and testing, we’re giving business owners exactly what they want. These privacy panels can be mounted front-to-back or side-to-side on virtually any flat worksurface from .75” to 2” thick. The panels are available in 12, 18, and 24” heights to provide just the desired amount of privacy. Like our cubicle extenders, these dividers mount in minutes with just an Allen wrench (provided with your order). Now, it’s easy to blend the collaborative environment of the modern office with the secluded spaces needed for work that requires more concentration.